I have had Reggie on my draft board all year long, and was probably the only one to have him on the board. Reggie has great hands and was a force in his division. 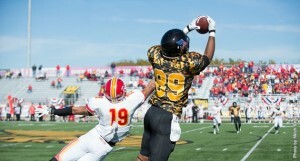 Over the past several years Missouri Western has shown they have NFL talent. Greg Zuerlein, David Bass and Michael Hill have all came out of the school in the past 2 years. Expect Reggie to be the fourth. He is too smooth of a pass catcher, he could wind up being the next big time small school tight end ala Julius Thomas. Out of High School I was being recruited by SEMO and UT Martin it was a couple D2 schools out of the MIAA also. I chose Missouri Western because I got a really good vibe from them and it just felt like home. They told me about plans of the facilities and the chiefs so that played a big role also. My grades weren’t the best also and I felt like Missouri Western was willing to give me a chance. My goals for senior year was to win another conference championship and make another run for a national championship. As far as personal goals, 1st team All-American honors. Have any scouts met with you, and if so what are they saying? A lot of scouts came during the season, somewhere in the 20’s. They all seen me as a joker type player that could play many different roles. What separates me from the others is very solid in all areas. I might not be the strongest, but I’m pretty strong. I might not be the fastest, but I’m pretty fast. I’m a all around between type player. If I could compare myself to one player in the NFL it would be Jordan Reed from Washington. We have just about the same measurables and I just like his game play. My biggest obstacle in my life would be being homeless, I overcame this by coming to Missouri Western. I like the Patriots double tight end offensive scheme a lot. Before they had the issues with the TE’s it was a great scheme. My strength is my big play abilities and my hands. My weakness is not being a traditional size tight end. I would tell a GM that I’ve been a sleeper all my life, I’m just looking forward to proving people wrong once again. Michael Jordan, I mean who didn’t love Mike. My favorite team is the St. Louis Rams, my favorite players are Jerry Rice and Adrian Peterson. Jerry Rice wasn’t a speed guy but he did all the little things right to stay open. Adrian Peterson, because he runs so hard and he works for every single yard. My first paycheck is going to a new vehicle. Nothing too spectacular just something reliable.